Welcome to WORLDING THE BRAIN! This website was dedicated to a symposium held in Amsterdam. Below, please find our opening and mission statement. The idea of this symposium emerged from our research program at the Amsterdam School of Cultural Analysis which is centered around “neuroaesthetics and neurocultures.” Over the last four years we have been meeting regularly, reading neuroscientific articles in relation to philosophy, literature, film, big data and art, discussing the significance of the neuroturn in science, in culture and in aesthetics. Working across a variety of disciplines in the humanities, we always felt that it was not enough to be critical of this turn, but wondered what insights the different fields can offer, and which ones might be left out. We also and especially want to enter in dialogue with artists and scientists, with a curious and creative open mind, to learn, to be challenged, to challenge, to find patterns, rhythms and narratives in which we differ and that we share with others. 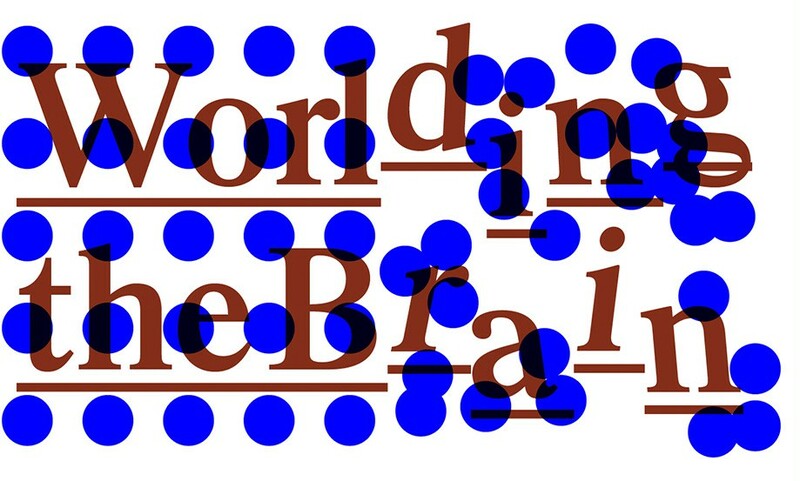 And so after a few years of reading and talking to many different guest speakers, as a research group based in the humanities, we thought it was time to make a next step and call for this event – to “worlding the brain”. We have been inspired to this title by a longer tradition of using the noun ‘world’ as a verb (‘wordling’, ‘to world’) in the humanities, in philosophy and cultural studies in particular. For the philosopher Martin Heidegger, ‘worlding’ meant the opening of new ways of being-in-the world, of being in time and history, that works of art perform in a particular way. The term ‘world’ here has a phenomenological ring and can come with connotations of ‘wholeness’ and a meaningful totality of relations (‘my world…’) that other adaptations of the term have since then challenged. In science studies and the work of Donna Haraway, for instance, ‘worlding’ refers to the co-operative and conflictual ways of ‘world-making’ in which different species, technologies and forms of knowledge interact. The postcolonial critic Gayatri Spivak – deliberately ‘vulgarizing’ Heidegger, as she said – understood ‘worlding’ as the imposition of order and control on a foreign territory. Yet, through all its critical transformations, the notion of ‘worlding’ has retained one aspect that we find valuable and inspiring for our own appropriation – or vulgarization, if you like – of the term: namely that it links the ‘world’ and ‘worldliness’ to an act, to something we do. ‘Worlding the brain’, then, is something that we all do constantly, without thinking about it, when we place our brains and bodies in the world, in various contexts and environments, and interact with them. And this entanglement, as most scientists and scholars would assert today, is a mutual one that changes the extra-cerebral world as well as the brain. But ‘worlding the brain’ is also something that can be done scientifically, by thinking about and studying these interactions. In the last decades, knowledge of the brain has made the journey from the labs of neuroscientists out into the world, where it has taken on a life of its own in various social fields and artistic and intellectual discourses, including the humanities. At the same time, cognitive neuroscientists are now increasingly interested in how the brain’s functional and structural properties are partly determined by its material, social and cultural environments. New research has begun to address how the brain responds to specific social and discursive practices or cultural information and how it is influenced by art, social interactions and technology. Hence, the worlding of the brain occurs when we place the brain in worldly contexts, study its interaction with various environments and reflect upon its entanglements with cultural practices and processes. With this conference, we hope to provide a forum for the exchange of ideas on how to do such ‘worldings’. We suggest the central themes of patterns, rhythms and narratives as ‘interfaces’ for this multi-disciplinary discussion. Now it can seem that the two ways of ‘worlding’ of the brain that we mentioned – by ‘just’ existing and moving around in the world and by doing research, going to conferences etc. – are in principle entirely different things. However, artists, dancers and performers who involve their physical being and various forms of brain knowledge in their work demonstrate that this is an artificial separation. We therefore are happy that many artists from different backgrounds contribute to this conference as well, making it more than a multidisciplinary event. Before we start, we would like to take the occasion to express some words of thank, in particular to our keynote speakers Jean-Pierre Changeux, Katherine Hayles, and Andreas Roepstorff whose willingness to accept our invitation was an important impulse for use during the organization of this event. We would also like to thank all our partners who have provided funding for this event and of course you, the participants, who have accepted the challenge to present in such an experimental setting. We wish you all three very inspiring days full of thought provoking lectures and fruitful encounters! Banner & poster design by: Johanna Ehde & Anton Weflo.